Mirror dinghy kits from the 1960s and 1970s were made from 3/16" gaboon marine plywood (well, the outer two layers were gaboon). As plywood production went metric this thickness became harder and more expensive to obtain. 3/16" equals 4.6mm approximately, so nearest metric size, 5mm was adopted. Sorry, I don't have a date for the switch in the UK, but by the mid 1990's kits were 5mm gaboon marine ply. Gaboon (sometimes called Okoumé) is widely regarded as producing the lightest, strongest plywood hulls. 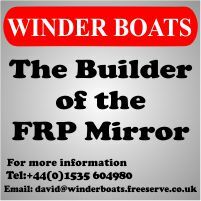 From the mid 1990's to 2015 the class rules (part A rule 7.5) stated that replacement hull panels had to be purchased from a Licenced Wooden Kit Manufacturer. These rules were relaxed in 2015, so you can use locally sourced ply instead. There is still a rule requiring boats that are substancially rebuilt to be remeasured. 5mm ply is not a "standard" plywood thickness, in contrast 4mm and 6mm which are commonly available and this has been an issue for kit manufacturers in countries where 5mm ply is hard to source (and thus expensive). The specification for the plywood used in a wooden Mirror hull (materials, thicknesses) was relaxed in 2017 with the issue of a new Wooden Boat Specification (part of the class rules). This now allows use of 4mm for some panels (e.g. decks, bulkheads,...) and 6mm (for hull panels), as well as 5mm and 4.6mm. 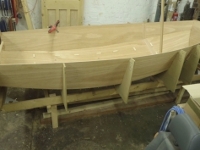 So a boat can now be constructed from a mixture of 4mm, 4.6mm, 5mm & 6mm ply. Robbins Timber in Bristol sell 5mm gaboon in their Robbins Elite range. There are other possible manufacturers of 5mm Gaboon for example Joulbert Plywood (France), Bruynzeel Multipanel (Dutch) & Corà Domenico & Figli - S.p.a. (Italian). It's just going to depend on what is locally available from your timber merchant, but please make sure it is marine ply to BS 1088. If you can't get 5mm, you can use 4mm for some parts and 6mm for other parts as per the Wooden Boat Specification.